Coach Pat Shurmur said he hasn't talked to the front office about Manning and the quarterback situation, Ralph Vacchiano of SportsNet New York reports. Manning completed 30 of 47 pass attempts for 316 yards, one touchdown and two interceptions during Sunday's 20-13 loss to the Redskins. 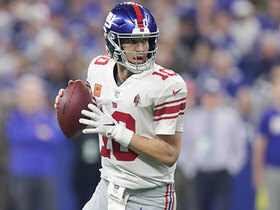 Coach Pat Shurmur confirmed Tuesday that Manning would remain the Giants' starting quarterback Week 8 against the Redskins, Ryan Dunleavy of NJ.com reports. Manning completed 27 of 38 passes for 399 yards and a touchdown in Monday night's 23-20 loss to the Falcons. Manning completed 24 of 43 passes for 281 yards, no touchdowns and one interception in Thursday's 34-13 loss to the Eagles. He also took four sacks and fumbled, though it was recovered by his own team. Analysis: Manning's stat line was poor, but it understates how badly he actually played, throwing passes too high, too low and off target. 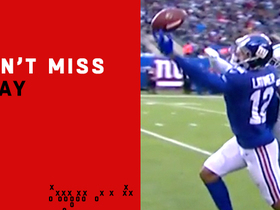 He was bailed out on some catch and runs by Saquon Barkley and Odell Beckham, and Beckham again caught some balls that were off the mark. The Giants don't have great alternatives on the roster, but it's hard to see how a team can tolerate this level of QB play given the top-shelf offensive skill players around him. Manning completed 22 of 36 pass attempts for 326 yards, two touchdowns and two interceptions during Sunday's 33-31 loss to the Panthers. Manning dink and dunked his way to 255 yards and a touchdown on 41 attempts (6.2 YPA) against the Saints on Sunday. He didn't throw an interception but took three sacks. 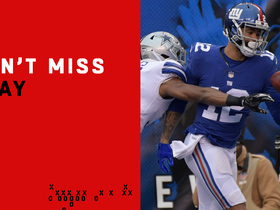 Analysis: Manning completed 76 percent of his passes, but everything was underneath, and the team's longest pass play was a 27-yard catch and run by Odell Beckham. The schedule doesn't get any easier with the Giants traveling to face the Panthers next week. Manning completed 25 of 29 passes for 297 yards (10.2 YPA), two touchdowns and no interceptions Sunday against the Texans. He took four sacks. Analysis: This was a vast improvement from last week's debacle as Manning showed he can still be competent when he has time. Pat Shurmur's system and Manning's elite weapons could carry him to a useful fantasy season if the line holds up. Manning completed 33 of 44 passes for 279 yards and a touchdown during Sunday's 20-13 loss to the Cowboys. He added four rushing yards on three carries. Manning completed 23 of 37 passes for 224 yards and an interception while failing to throw a touchdown and rushing once for two yards in Sunday's 20-15 Week 1 loss to Jacksonville. Analysis: Little was expected of Manning against Jacksonville's vaunted pass defense, so this fantasy dud was hardly surprising. His lone interception was a costly mistake, as it was returned by Myles Jack for a 32-yard touchdown. On the bright side, Manning appears to be flanked by two elite playmakers now after having none for most of last season. Odell Beckham caught 11 balls for 111 yards while Saquon Barkley broke off a 68-yard touchdown run. Manning, who completed 17 of 23 passes Friday night, has a good chance to set a career high in completion percentage this year under new coach Pat Shurmur, who presided over Sam Bradford's record-setting 2016 (71.6 percent) as well as Case Keenum's 67.6 percent last season, the Newark Star-Ledger reports. Analysis: Manning's career high is 63.1 percent (2014), so it's not an especially high bar to clear. Having Saquon Barkley, Sterling Shepard, Evan Engram and Odell Beckham around should also help, and Manning will be asked to move more and complete passes from outside the pocket. Manning's ceiling is probably capped by his lack of rushing ability and middling accuracy, but this is the best system and personnel he's had in his entire career. Manning completed 17 of 23 passes for 188 yards with no touchdowns or interceptions in the Giants' 22-16 preseason win over the Jets on Friday. Manning may play at least a half during Friday's preseason game against the Jets, Art Stapleton of The Bergen Record reports. Manning remained on the field for extra work prior to Friday's preseason game against the Lions, which Jordan Raanan of ESPN.com views as a good indication that the QB won't play in the contest. Analysis: The same applies to wideout Odell Beckham, with the duo likely to see some run next Friday against the Jets. With Manning expected to rest, Davis Webb figures to see extended action against Detroit. Jordan Raanan of ESPN.com relays that he'd be "surprised to see much" from Manning in Friday's preseason game against the Lions. Analysis: Look for the veteran QB to see more action in the third week of the preseason versus the Jets. For now, the Giants appear inclined to take it easy on the likes of Manning and Odell Beckham, who isn't expected to play Friday. Manning played the first two drives of Thursday's preseason opener against the Browns. He completed four of seven passes for 26 yards without a touchdown or interception in the 20-10 loss. 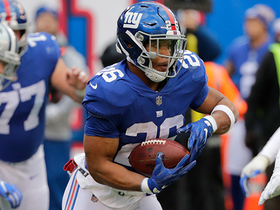 Analysis: Manning led New York to a field goal on the game's first drive, though a 39-yard run by rookie Saquon Barkley accounted for most of the team's yardage on that possession. The veteran quarterback was sacked on his final snap, but there was no sign of injury on the play and he was scheduled to come out after two drives regardless. It's tough to make many judgements about Manning based on this performance considering premier receiving option Odell Beckham sat this one out. Manning will collect a $5 million roster bonus, ESPN.com's Jordan Raanan reports. Head coach Pat Shurmer expressed confidence in Manning on Friday, Ralph Vacchiano of SportsNet New York reports. "I think he's got years left," Shurmer said. "How much? I don't know. But I think he has time left and I look forward to working with him." Manning completed 10 of 28 pass attempts for 132 yards, one touchdown and on interception during Sunday's 18-10 win over the Redskins. 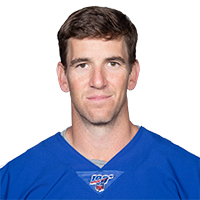 Giants interim head coach Steve Spagnuolo said that his "hope" is that Manning will take every snap in Sunday's game against the Redskins, Ralph Vacchiano of SportsNet New York reports. Manning said Tuesday during a weekly radio appearance that he isn't considering retirement and hopes to remain with the Giants in 2018, Tom Rock of Newsday reports. "I don't know what's going to happen, I don't think anyone does," Manning said of the Giants' plans for him next season. "I love playing football, I love playing quarterback, and I want to continue to do it for the Giants. This is the only team I ever wanted to play for and I don't want to change. I do understand how this season has gone and new people [are] coming in. If they want to make a change, then we'll go down that road." Interim head coach Steve Spagnuolo said Manning will start against Washington in Week 17. 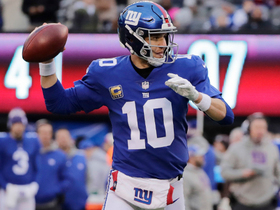 Giants interim head coach Steve Spagnuolo said it's a pretty good assumption Manning will start against the Cardinals in Week 16, Ralph Vacchiano of SportsNet New York reports. Analysis: Manning enjoyed a vintage performance in Sunday's 34-29 loss to the Eagles, completing 37 of 57 passes for 434 yards with three touchdowns and an interception. There's been talk of the Giants taking a look at rookie third-round pick Davis Webb, but it's also possible the team decides to let Manning finish out the season. It sounds as if the veteran will get at least one more start, heading to Arizona for a tough matchup against the Cardinals on Christmas Eve. Manning completed 37 of 57 passes for 434 yards, three touchdowns and an interception during Sunday's 34-29 loss to the Eagles. Manning will get another start Week 15 against the Eagles, Jordan Raanan of ESPN.com reports. Analysis: While the Giants may still decide to take a look at Davis Webb before the end of the season, it apparently won't happen this week. Manning didn't exactly make the best case for himself in Sunday's 30-10 loss to the Cowboys, completing 31 of 46 passes for only 228 yards with one touchdown and two interceptions. In his defense, the Giants committed a number of ugly drops when the game was still competitive, while both interceptions occurred late in the fourth quarter in desperation mode. Manning completed 31 of 46 pass attempts for 228 yards, one touchdown and two interceptions during Sunday's 30-10 loss to the Cowboys. Analysis: Manning managed a paltry five yards per attempt as he produced just one pass play over 16 yards on the day. He managed to refrain from turning the ball over until the fourth quarter, when he unfortunately threw interceptions on back-to-back possessions to end his team's opportunity to climb back into the game. Manning figures to remain the starter next week against the Eagles, but this performance doesn't bode well for his ability to produce against an even tougher opponent. Manning is slated to start Sunday's game against the Cowboys, NFL.com reports. 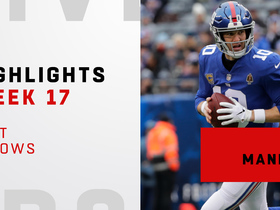 Giants interim head coach Steve Spagnuolo is expected to name Manning as the starter for Sunday's game against the Cowboys, Jordan Raanan of ESPN.com reports. 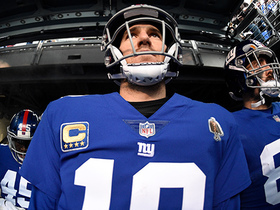 The Giants might turn back to Manning as their starting quarterback, following Monday's firing of former head coach Ben McAdoo and former general manager Jerry Reese, Ian Rapoport of NFL Network reports. Manning said he plans to play in 2018, Jordan Raanan of ESPN.com reports. Manning's father, Archie, intimated Thursday that his son could be considering retirement after the 2017 season, Ian Rapoport of NFL Network reports. 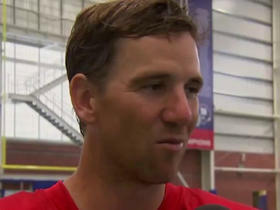 "There's no sense speculating," Archie said, regarding Eli's future in the NFL. "If he's still there, we don't know what their future plans are, if other people are there. And you have no idea what other teams will think of a 37-year-old quarterback. You don't have any idea. Eli might say, 'I've had enough. I'm feeling good. I've got a beautiful wife, three little girls, I'm healthy. And that's it.' So there's no sense speculating." Manning will be the backup to starting quarterback Geno Smith for Sunday's game in Oakland, Ralph Vacchiano of SportsNet New York reports. Analysis: On Tuesday, Giants head coach Ben McAdoo made the decision to elevate Smith and presumably rookie Davis Webb in what has become a lost season for the Giants. One day later, McAdoo termed Webb the No. 3 quarterback for Week 13, meaning Manning will be active and available behind Smith. Although an appearance this weekend isn't likely, Manning could see snaps if Smith struggles more than expected or succumbs to an injury. Manning will not start at quarterback in Sunday's game against the Raiders and is not expected to play for the rest of the regular season. Analysis: Given that Manning has started 210 consecutive regular-season games for the Giants, coach Ben McAdoo gave Manning the option to start Sunday, but the veteran declined, which will put his streak to an end. Geno Smith will start at quarterback in Manning's place, with rookie Davis Webb expected to see some time under center eventually, too. As of now, it's unclear what Manning's future with the franchise is, but this is the first sign that his time in New York could be coming to a close. Manning completed 13-of-27 passes for just 113 yards and an interception in Thursday's 20-10 loss to the Redskins. Analysis: The Giants struggled offensively the whole evening. Their only touchdown came off an interception in the third-quarter. Manning did not get much help from his receivers, as there were several drops on the evening. He will look to bounce back when the Giants face the Raiders in Week 13. Manning completed 19 of 35 passes for 205 yards without a touchdown or turnover while rushing twice for five yards in Sunday's 12-9 overtime upset of the Chiefs. Analysis: It wasn't pretty, but Manning got the job done by protecting the ball in a defensive battle. 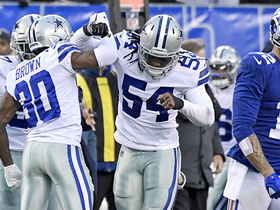 He connected with Roger Lewis for an incredible 34-yard catch late in overtime to get to the two-yard line on 4th-and-6, setting up Aldrick Rosas' game-winning, 23-yard kick. Manning's touchdown-to-interception ratio remains an underwhelming 14:6. Manning completed 28 of 37 pass attempts for 273 yards and two touchdowns Sunday against the 49ers. He also lost a fumble. Analysis: Manning completed a superb 76 percent of his passes and finished with his third-highest yardage total of the season. He completed touchdown passes to Evan Engram and Roger Lewis, giving him multiple TDs for the second straight week. Manning has yet to put together a consistent run of strong form this season and has 14 touchdowns compared to 10 turnovers, but he's played more effectively of late and will go up against a beatable Chiefs defense in Week 11. Manning completed 20 of 36 pass attempts for 220 yards, two touchdowns and one interception during Sunday's 51-17 loss to the Rams. He also lost a fumble.